They’re the lifeblood of homeownership. The glue that binds buyers to sellers, families to dwelling places. They’re Realtors, and they represent one of VHDA’s most important stakeholder groups. That’s why VHDA presents its Service to Virginia Award annually to the Virginia Realtor who has significantly promoted affordable homeownership to first-time buyers in the past year, or whose life’s work speaks to this issue. 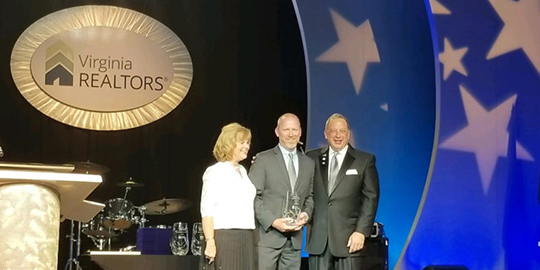 The 2018 award winner – selected by his peers from among 34,000 members statewide – is Greg Slater of the Charlottesville Area Association of Realtors. He was one of the first agents in Virginia to champion solar panels as a means of reducing a home’s carbon footprint and lowering homeownership costs. In the past, he has worked with local and national builders to run pilot programs to demonstrate the ready availability of funding sources for solar power, as well as its efficacy. A Realtor since 1996, Slater is a member of Nest Realty group and a representative for Bramante Homes, Inc. He received his award at the Virginia Realtors annual awards and installation banquet in September. Awards were also given to agents for excellence in property management, brokerage, education and other business achievements. For details, visit VirginiaRealtors.org. VHDA congratulates Greg Slater for receiving its 2018 Service to Virginia award and salutes all the Realtors in the Commonwealth for their indispensable role in the homeownership process.